Somehow, I had not read any books by the Irish writer Colum McCann, who has written international bestsellers and won many awards, including the National Book Award for Let the Great World Spin. Listening to this audio recording of his latest book was a wonderful way to make his acquaintance. Now all I need to do is find recordings of his earlier books. TRANSATLANTIC. By Colum McCann. Read by Geraldine Hughes. Random House Audio. 9 compact discs, 10 ½ hours. $40. Also available in print from Random House. Colum McCann, who himself made the journey from the Ireland of his birth to the United States where he lives, gives us a novel that weaves its magic around three historic transAtlantic crossings between Ireland and North America. 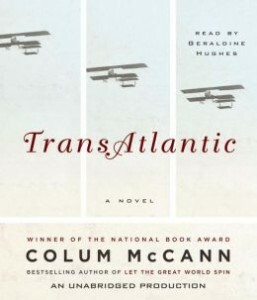 The book opens with a gripping narrative about two men, Jack Alcock and Arthur Brown, in 1919, as they attempt the first nonstop flight across the Atlantic, from Newfoundland to Ireland in a modified World War I bomber. This story is true, even if not as well known as Lindbergh’s later solo flight, and McCann’s skilful prose, vivid with detail, brings it to suspense-filled life. He manages to deal with both the intimate and the universal, creating the aviators as real people, and suggesting how their feat would help change the world. The other true crossings McCann deals with move backward and forward in time. Frederick Douglass, the former American slave turned abolitionist, visits Ireland in the 1840s on a lecture tour to promote his autobiography and his cause. While there, he begins to realize that, in the midst of the potato famine, the terrible poverty of some Irish people is worse, in a way, than slavery. And nearly 80 years after Alcock and Brown’s flight, U.S. Sen. George Mitchell, who has Irish blood flowing in his veins, jet-sets back and forth between the United States are Ireland, working desperately to achieve peace in the bitter, bloody land of his paternal ancestors. Each of these threads of the book is almost complete in itself, and at first each seems largely self-contained. But gradually, subtly, McCann uses his fictional characters to bring them all together into a greater whole. The link begins, we come to understand, with Lily Duggan, a young Irish maid who is inspired by Douglass when he’s a visitor in the home where she works. Lily embarks on her own transAtlantic journey, making her way as an immigrant in the United States, where she eventually gets caught up in the American Civil War. In many ways, Lily is the strongest and most fully developed character in the book. It is the stories of Lily and her daughter, granddaughter and great-granddaughter – in the United States, Newfoundland and Ireland – that elevate this book to a masterwork of fiction. Through them, and the way their seemingly insignificant lives intersect with historic events and link the past to the present, we learn much about Ireland, and about life. There is much sorrow in life, to be sure, but there is also grace, and hope. Geraldine Hughes, an Irish actress, reads this story with just the right lilt in her voice and a hint of an accent that evokes Ireland without being difficult to follow. McCann’s prose is at times spellbinding, and Hughes enhances the spell. This entry was posted in Audio Books, Contemporary literary fiction and tagged Colum McCann, Irish fiction. Bookmark the permalink.